Some 400 high-tech South African traffic lights are out of action after thieves in Johannesburg stole the mobile phone Sim cards they contain. The thieves ran up bills amounting to thousands of dollars by using the stolen cards to make calls. Johannesburg Road Agency (JRA) said it is investigating the possibility of an "inside job" after only the Sim card-fitted traffic lights were targeted. The cards were fitted to notify JRA when the traffic lights were faulty. JRA believes a syndicate "with links on the inside" is behind the thefts. "We have 2,000 major intersections in Johannesburg and only 600 of those were fitted with the cards," the agency's spokesperson Thulani Makhubela told the BBC. "No-one apart from JRA and our supplier knows which intersections have that system." He described the thefts as "systematic and co-ordinated". "The vandalism began with a few lights in November and we repaired them. Over December the thieves struck again, this time hitting hundreds more, including the ones we had repaired," he said. "These people know what they are doing." 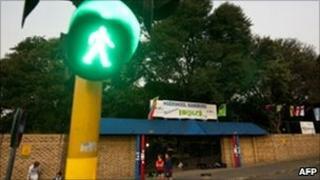 Repairing the faulty traffic lights will cost JRA about 9m rand ($1.3m; £870,000). JRA has said it has blocked all the stolen Sim cards so that they cannot be used to make further calls - but this was not before the thieves had run up huge bills. "One card had a bill of 30,000 rand ($4,500; £2,900) and we are talking about no less than 150 Sim card bills. Whichever way we look at it we are talking about a lot of money," said Mr Makhubela. Several cases of theft and vandalism have apparently been opened across Johannesburg. Johannesburg's roads have been fairly quiet over December but with hundreds of holiday-makers expected to return over the weekend, the damaged lights pose a hazard in the city's major roads says the BBC's Pumza Fihlani in Johannesburg.